-Revelations and steamy passion make up the final installment of J. Strickland’s best-selling series. 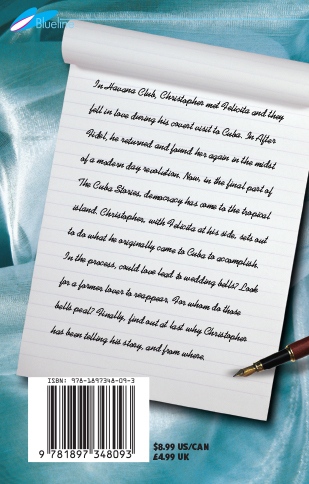 In Havana Club, Christopher met Felicita and they fell in love during his covert visit to Cuba. In After Fidel, he returned and found her again in the midst of a modern day revolution. Now, in the final part of The Cuba Stories, democracy has come to the tropical island. Christopher, with Felicita at his side, sets out to do what he originally came to Cuba to accomplish. In the process, could love lead to wedding bells? Look for a former lover to reappear. For whom do those bells peal? Finally, find out at last why Christopher has been telling his story, and from where.